Last week we began working on strengthening the feet. You might be to the point now where you can see some space developing between your toes when you attempt to separate them. This week we are going to tackle another very important component to efficient running, strong feet, strong calves. Listed below are two exercises to add to your routine. Stand with the balls of your feet on the edge of a sturdy step. Let your heels come below the level of the step until you feel a slight stretch, then lift your heels up until you are on your tiptoes. Start with repetitions of 10-15 for 1-2 sets. The goal is to get strong enough to perform 2 sets of 30 repetitions. After performing your heel raises stretch out the calves by keeping one knee straight, and bending the other knee allowing the heel of the straight leg to go below the level of the step. Hold the stretch for 20 seconds, repeat 2-3 times each side. 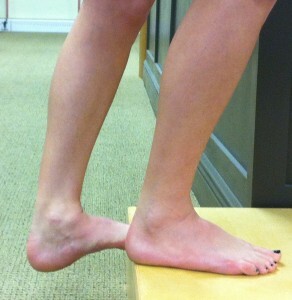 Look for our next running blog, Tuesday to learn dynamic stretching techniques for the foot and ankle.